As depicted in the documentary, Return to the Valley, Japanese Americans of the Santa Clara Valley and the Central Coast region weathered their wartime expulsion and imprisonment and returned to reestablish their community in the post war period. Although composing only 1.3 percent of the total population of San Jose (U.S. Census, 2000), Japanese Americans continue to have a visible and significant presence in the city's political and cultural life. In the post war period, they successfully created a vibrant and active community, featuring a large array of social, cultural, political and religious organizations and public activities. This community however, has greatly changed in function and structure since the pre-World War II period. It is important to place the current community in its historical context to understand the role it plays today as well as some of the major questions facing its future development. Prior to World War II, Japanese Americans developed farming communities or "clusters" (see article on Farming in the Santa Clara Valley) in outlying areas of the Santa Clara Valley. San Jose's Nihonmachi or "Japantown" served first as a place that had housing for Japanese immigrant field labors, but eventually developed into a place that provided needed services for Santa Clara Valley Japanese American farmers and growing Japanese American families. The wartime removal and incarceration of Japanese Americans disbanded the cohesive farming communities and forever changed Nihonmachi, ending its role as a segregated "enclave" or ghetto. Mr. Kawakami, director of the San Jose Civic Unity Hostel in front the San Jose Buddhist Church Betsuin in 1945. The Church, dedicated in 1940, replaced an earlier structure built by the Issei pioneers. The Church property was held in trust during World War II by San Jose attorney, Ben Peckham, a friend to the Japanese American community. It survived the War intact. It is still considered a vital part of the community today. Left Bancroft Library, Right KTEH. Upon return from the camps, the Issei or first generation Japanese Americans and their children, the Nisei eventually had to find employment outside of the traditional bounds of farming, having been displaced from family agricultural land and activities taken over by other groups and business interests during the war. Out of necessity, the Nisei had to find ways to integrate themselves into the overall economic life of the valley, ending the economic basis of the community—farming and support services based on agriculture. However, many now raising families desired to maintain social and cultural ties to their community. For these individuals, the Nihonmachi area became important as a cultural and social center where they could continue to practice customs and activities they felt important to continue for their children's and aging parent's sake. Much of this focused on reestablishing the major religious organizations in the area, such as the Buddhist and Methodist churches, but also included civic organizations such as the Japanese American Citizen's League and community organizations that provided recreational and social opportunities. Many Nisei, fearing continued discrimination felt they and their extended families would not have access to the same opportunities these organizations offered outside of the Japanese American community. 1) Business interests, including such organizations as the Japantown Business Association. These groups continue to monitor and discuss what direction the business community should take in face of many demographic transformations. 2) Religious organizations, including the two largest ethnic churches, the San Jose Buddhist Church Betsuin and the Wesley United Methodist Church. These institutions sponsor many other social clubs, activities and community wide events such as Boy Scout and Girl Scout troops, large festivals such as the "Obon festival" and many other service-related groups. 3) Civic and Social Service organizations, including the Japanese American Citizens League and social service agencies originally formed by Sansei such as the Yu-Ai Kai/Japanese American Senior Service and the Asian Law Alliance. 4) Cultural and educational organizations, including arts groups such as the San Jose Taiko Club, children's educational programs such as Suzume no Gakko, and the Japanese American Museum of San Jose. 5) Recreational organizations, including sports leagues and recreational groups such a the Community Youth Service (CYS) that hosts year-round team sports for youth, and various traditional Japanese martial arts clubs that teach Judo and Kendo. Currently, individuals and groups active in the community are involved in ongoing discussions about what the future will hold for Japanese Americans. Some individuals with the support of the City of San Jose have formed a "Japantown Community Congress" to discuss development and planning related issues as well as efforts to obtain state funding to preserve Nihonmachi as an historic community site. 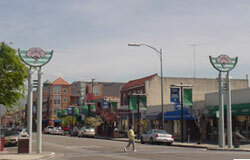 San Jose's Japantown remains the only traditional "Japanese Town" that has not gone through urban renewal. The streets and shops (though modernized) still look as they did in 1940. Many longtime stores such as the Kogura Gifts, still are family owned and operated. However, it is unknown how much longer this most "rural" of the Japantowns will remain in its present state. Those involved in the community continue to voice many different questions about the fate of their community. 1. Concerns that the community will be "over-run" by non-Japanese Americans who will take away opportunities for Japanese Americans to carry out their cultural or social traditions, and possibly challenge existing Japanese and Japanese American oriented businesses. There are conflicting feelings regarding the need to "market" Nihonmachi to appeal to a more diverse base of the region's population while trying to retain the Japanese American character of Nihonmachi intact. 2. Concerns that the decline of the Japanese American population and the dispersal or assimilation of the remaining population will lead to loss of customers for the business in Nihonmachi and involvement in the various organizations and activities of the community. Some family run businesses that trace their origins to the pre-World War II period are concerned that their children will not continue with the family business and other individuals wonder if Nihomachi will have relevancy to the interests or needs of future generations. 3. Concerns that local Japanese American history and the values and heritage many Japanese Americans wish to preserve will be forgotten and lost to society. This includes future physical development of historic structures in the neighborhood as well as cultural and social practices. Efforts continue in this area to secure city and state support to help with economic development plans and to create public projects that emphasize the unique cultural contributions of Nihonmachi. San Jose's Japanese American community has historically faced many challenges. It adapted to major changes spanning many different political, economic and social issues. Today's community will continue to change and develop as we move into a new century. 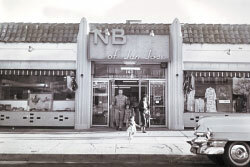 The Tatsuno family store opened in 1948. Tatsuno Family. Asian American children's literature is a fast emerging field. Many fictional books are now being published featuring Japanese American children as they interact with their peers at school and their culture at home. Although we have chosen to include only non-fiction material in this section, we encourage young readers to explore all types of books. Nickles, Greg, (2001) The Japanese, Crabtree Publishing, ISBN: 0778702073. This is one of Nickles "We Came to North America" series about immigrants for children. The book covers Japanese American history, including internment and the modern community as well. Reading level 4th grade and up. Hoobler, Dorothy and Hoobler, Thomas, with introduction by George Takei (1998), The Japanese American Family Album, Oxford University Childrens' Press, ISBN: 0195124235. Organized into six chapters, the book covers Japanese American history from the earliest immigrants to Hawaii, to the present day. Reading level, 4th grade and up. Part of the "American Family Album" series. McDaniel, Melissa, (2002) Japanese Americans, Child's World, ISBN: 1567661548. This is a simple introduction to Japanese immigration and their history in America. It also covers well-known Japanese Americans of today. Reading level, 4th grade and up. Kitano, Harry H. L. (1993) Generations and Identity: The Japanese American, Ginn Press, ISBN: 0536583706. Kitano writes about change and diversity of Japanese Americans. Misawa, Steven, editor (1980) Beginnings: Japanese Americans in San Jose . San Jose; San Jose Japanese American Community Senior Service. This book is out of print and may be available through rare and used book services such as www.alibris.com Niya, Brian, editor (1993) Japanese American History: An A to Z Reference from 1868 to the Present, Facts on File, Inc. ASIN: 0816026807. This is an encyclopedia style book in four sections: a chronology of major events in Japanese American history; more than 400 A to Z entries on significant individuals, organization, events and movements, and a thorough bibliography. Takahashi, Jere, (1997). Nisei/Sansei: Shifting Japanese American Identities and Politics. Philadelphia: Temple University Press, ISBN: 156639550X. Takahashi challenges studies that describe the Japanese American community's essentially linear process toward assimilation into U.S. society. Yoo, David, (1999) Growing Up Nisei: Race, Generation and Culture among Japanese Americans in California, 1924-49. University of Illinois Press, ASIN: 0252025083. This book traces the emergence of a dynamic Nisei subculture and shows how the foundations laid during the 1920s and 1930s helped many Nisei adjust to the upheaval of the concentration camps. Japanese American identity is being discovered and explored more frequently by independent filmmakers. Here's a sampling of what's currently available. Asian Law Alliance www.asianlawalliance-ala.org Non-profit organization providing legal an advocacy services to Asian Pacific Americans based in Nihonmachi. Japantown Business Association www.japantownsanjose.org Organization dedicated to promoting the economic, cultural and social well-being of Nihonmachi. Yu-Ai Kai Japanese American Community Senior Service of San Jose www.yuaikai.org A non-profit agency established to provide bilingual and bicultural services for the elderly. San Jose Buddhist Church Betsuin www.sjbetsuin.com Web site for the largest Japanese American Buddhist church in Nihonmachi. San Jose Taiko www.taiko.org Web site for a Japanese drumming performing arts group. Japanese American Citizens League at www.jacl.org. The Japanese American Citizens League (JACL) is a membership organization whose mission is to secure and maintain the human and civil rights of Americans of Japanese ancestry and others victimized by injustice. Teachers may also order curriculum guides directly from the website.